Illustration by Norman Borchardt, for Konrad Bercovici, Around the World in New York (New York: Century, 1924), p. 283. 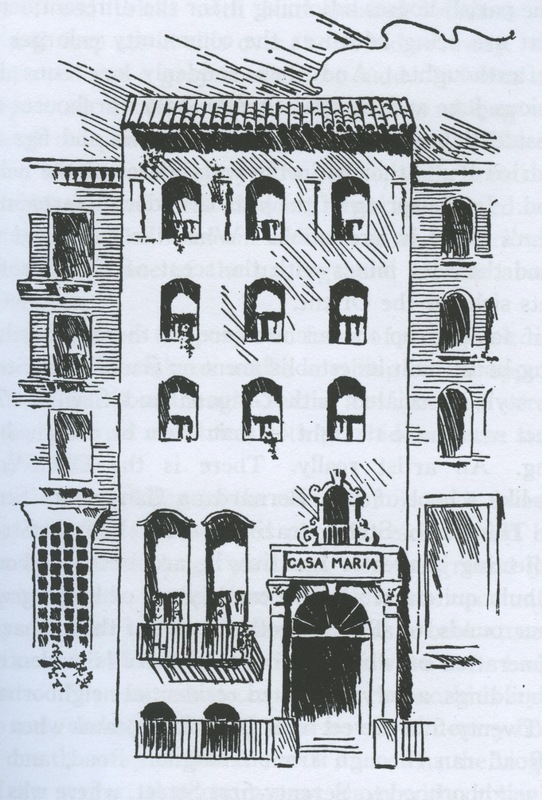 Casa Maria (Spanish Settlement) 215 West 14th Street, under the patronage of the Augustinian Fathers of the Assumption. The object of this Association is to promote the temporal, social, mental, moral and religious welfare of young women, particularly for those dependent upon their own exertions for support. Address Mrs. M.A. Lopez, Manager. 215 West 14th Street in 2011, courtesy Google. The houses on Fourteenth Street between Seventh and Eighth Avenues are built on very narrow strips of frontage land. And each one, even though of the same height as the next one, is built in an individual style. There are houses of red bricks with black-painted windows and doors, and deep set-in sills over the round archway. And between a red and a gray house there suddenty looms up a yellow-painted stucco building, with narrow oblong windows and red-painted lucarnes between them. There is the Casa María, of rough yellow stucco, with beautifully lined windows and vaulted doors that are barred by wrough iron. The basement entrance is as mysterious as the descent into one of the underground piazzas around the Alhambra. My mother Elvia Perez Borges lived at Casa Maria when she first immigrated from Cuba in 1948. I have fond memories of Casa Maria visiting as a child, my mother made life long friends there.